Buying a home can be a very emotional experience, and in the moment, it’s easy to forget to ask some important questions. 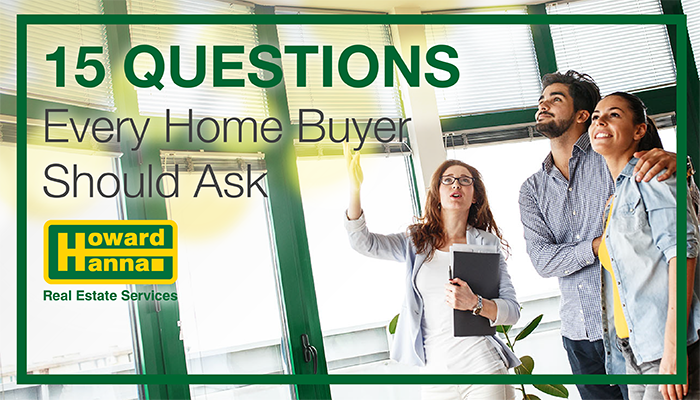 To help keep you on track and be sure you’re not walking into a trap, we’ve made a checklist of the top 15 questions to ask before saying “yes” to the home. You can print this list out and take it with you for reference! 1. How much traffic does this road get? If it gets a lot of road traffic and the bedrooms face the road, then you can expect to have a hard time falling asleep at night, unless the home is extremely well insulated. You may sleep like a rock, but will your newborns or dogs sleep through that noise? If the road gets a lot of foot traffic, then you may have some surprise visitors at odd hours of the day. 2. Does the neighborhood match your preferred lifestyle? If you work from home, a concern may be hearing your neighbor’s dog barking at eleven in the morning when you’re on a very important conference call, or any other distracting noises. Conversely, if you have dogs, a concern may be whether or not the neighborhood has a dog park. 3. Is this house in an area that’s prone to flooding? OR Is this house at the bottom of a steeply sloped hill and, if so, has it been flooded before? If the house is in a flood-zone area, your next question should be: what measures are currently in place to prevent flood damage? For example, is there a French drain in the basement? To be safe, if you purchase this home, you should be sure you have Flood Insurance as well. Remember that homeowners insurance does not cover flood damage. For more about Flood Insurance, check out our blog post 3 Questions You Need To Ask Before Flood Season. 4. What is the crime rate in this neighborhood? You could look the information up online, but while you have the chance, ask the local law enforcement for their perspective. You can even ask your real estate agent to schedule an appointment for you to interview the local law enforcement, if it’s a major concern for you. 5. Has the house been tested for radon or ever had a mold inspection? The results from these two inspections could save your life. 6. What shape is the house in? Is it a newly remolded home, an older home, etc.? If the house is particularly old, keep in mind that it may require drastic repairs while you’re the homeowner. 7. When were all the appliances last updated? If the appliances are staying with the house and they were updated within the last year, they could still be on warranty. Be sure to get the warranty information on them from the home seller. 8. When are the sellers looking to close? If you’re a homeowner too and will have sold your home already before the sellers are looking to move out, you may have to stay in a hotel or apartment for a couple of days or weeks. Conversely, if you haven’t sold your home yet by the time they want to close, you might have two mortgages to juggle. In that case, check out our Buy Before You Sell program, which lets you take the equity in your current home and apply it towards the down payment of a new home. 9. What is NOT included with the sale of the home? It can be easy to assume that all the appliances will be, but the homeowner may choose to take them. Check to be sure you know which items you may need to purchase. You may even be surprised and find out the giant flat screen television and hot tub are staying with the home! 10. Is there a homeowners association for this area? If you wanted to build a fence around your yard to keep your dog in, is there a height limit, or are some materials forbidden? Are there specific days of the week you’re not allowed to have construction going on around your house (to limit noise levels in the neighborhood)? Do you have a specific aesthetic you’d like for the outside of your home, but you’re not allowed to paint the exterior certain colors? Be sure to ask questions about anything that is important to you! 11. What material are the pipes made out of? If it’s a very old house, this is an especially important question. Lead pipes are poisonous and need to be replaced immediately. 12. What material is the roof made out of? Different roofs have different lifespans and can cost more or less to replace; tile roofs are expensive, as each individual tile needs to be replaced; composite roofs have a tendency to last about 20 years before they begin to degrade, etc. If the roof is old, having to replace it soon is another thing to keep in mind. 13. Have there been any insect infestations in the past? Make sure you ask about termites, carpenter ants, fleas, etc. If there has been an infestation in the past, even if it was properly handled by a pest control professional, there could be another one in the future. Insects have a habit of surviving despite our best efforts to eliminate them. 14. Are there any pets buried in the backyard? If you love to garden, this is a particularly important question to ask, as you don’t want to go digging to plant new hydrangeas only to find out Fido is buried in your yard. 15. What is the neighborhood like? By now, you have a sense of if the neighborhood will match your lifestyle, but taking the chance to meet the neighbors in advance never hurts! Knowing what the neighborhood is like can help you determine if it’s a good fit for you and can help you get a jump-start on settling in, if you do buy the home. Buying a home doesn’t have to be stressful or headache-inducing. At Howard Hanna Real Estate Services, our goal is to help you make Home Happen Here. With our one-stop shopping, we offer real estate services, mortgage services, title and escrow services, and insurance services, taking the worry out of moving by guiding you through your entire home buying or selling experience. If you’re moving to a new area, our global and local Howard Hanna Relocation Services can also assist you with the relocation process. And if you’re thinking of listing your home, there’s no better time than during a seller’s market. Receive a free home estimate at howardhanna.com/whatsitworth and get started on listing your home today!